« Day 184 – Jon H.
Day 185 – Elijah A.
I am still struggling with my computer issues, but trying to push forward. Thanks for all the kind emails. The man that I am going to introduce you to today is someone that I had seen on Day 124 when I went for a run. 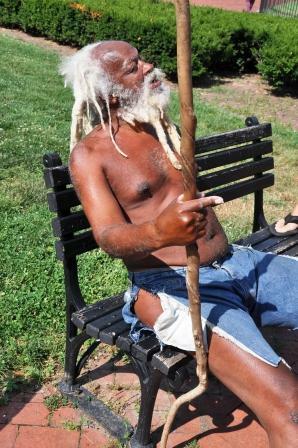 I was jogging through Lafayette Park which is just in front of the White House when I ran by a shirtless black man with matted cotton white hair sitting on a bench holding a wooden staff. I thought to myself…when I get home I’m going to get my $10 and go down there and give it to this guy! Well, as it turned out when I got back there I couldn’t find him. Fast forward 61 days and I was walking through Lafayette Park with a reporter and a photo-journalist (Jon from Day 184!) from Street Sense when I saw the same man. Unfortunately he was talking to someone so we sat down and waited to see if the other gentleman would leave so I could go and speak with the man I soon found out goes by the name Elijah Alfred Nature Boy Alexander Junior. Elijah was very friendly when I approached him and graciously accepted my invitation to sit and talk for a while. The only item of clothing he was wearing was a pair of jeans that had been cut all the way up the sides like a loincloth. It’s been years since he stopped wearing shirts and shoes. Originally from a place called Grambling in northern Louisiana, Elijah gave up his job at Southwestern Bell in Dallas, TX at the age of 31 and began wandering North America as an objective observer. He has been married twice and has fathered six children with five women. He shares a lot of information about himself on his website. I spent hours reading through different parts of his site and his Facebook Page. I thought I would share one of his many poems he has written and posted online. with two sisters older and sandwiched by an older and younger brother. while working also, and by the next year’s end had a military date. He was married the next spring to one Camala Louise Taylor, by name, who mothered Karn Marshell, a girl, and a boy the third of the same. where he, by one, helped the population to increase. totaling six (two in sixty five before the marriage relation). Dellie Mae Bolton, and before three months was a preacher man. Traveling by foot his comforts got heavy so the extras he shed. and became mentally, physically, spiritually, and financially free. He believes its how all christs, titled Christians, are called to be. He now divides his time between two residences in DC where he does some house sitting. This past winter he was the “fire guard” for the wood burning stove at one of the homes he stays at so he was not at the park as often. Given his choice to not use a lot of clothes, I asked him how he gets by in the winter. “I shovel snow,” he said with a smirk. Elijah has traveled extensively through North America, all by foot unless offered a ride. He tells me stories about the 5 Canadian provinces, 44 continental US states, 11 Mexican states that he has visited. 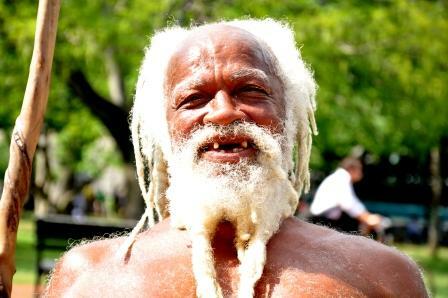 He then remembers that he even made it to Belize. “How could I forget Belize! I spent nine months there! Three and a half months of which I was in a mental institution there because they thought I was crazy and then four and a half months locked up in jail.” That is not the only place he has had accommodations behind bars. He has made visits to several jails around North America for indecent exposure; 32 visits in Louisiana alone, a place where he says the jails are usually quite nice and the people treat you pretty well. Elijah tells me about being arrested for taking an avocado from a fruit stand. “I was told by a higher power to get a piece of fruit, so I got it.” According to Elijah there is an old law on the books that allows the poor to enter grocery stores and take fruit without paying for it. I haven’t been able to find that law yet. I could go on and on talking about how interesting I found my chat with Elijah, but I want to encourage you to visit his website and get to know him for yourself. Elijah is someone who reminds us not to judge others by the clothes that they wear (or don’t wear). As for my $10, he said he would use it to get some fruit, this time he said he will pay cash for it. He learned his lesson about taking fruit and not paying for it a long time ago! Notes: Elijah holds office hours in Lafayette Park from roughly 10-5:00 every day. I bet he would love to meet you. You can see other photos of my visit with Elijah in this week’s Street Sense! Go buy a copy and help a vendor out! on July 2, 2010 at 8:08 am | Reply Elijah Alfred "NatureBoy" Alexander, Jr. Thank you so very much, Reed. I only find one error, I was here the entire winter, I only went back to Grambling for 2 weeks during Home Coming in October. I did not remain in the park during the winter because I was the “Fire Guard” for the wood burner used to keep one of the houses warm. Lafayette Park is my DC office, hours generally from 10 am ish until 5 pm ish 7 days per week. Howdy Elijah. Hope you’re well. I could comment back before posting. Looks like you’re still a very happy man. Could one ask for more? Take care, brother. I think I am bad soil… this makes me sad. I gave Elijah a ride across Oklahoma back in 2004 during a road trip from WI to AZ. Obviously, he stuck out like a sore thumb walking down the side of the interstate so I offered him a ride. He was headed to Oral Roberts University and I think we travelled a good 2 hours together during which we engaged in most spirited conversation. We dined on fresh persimmons from a tree on the campus upon arrival and that was the last I saw (or though) of him until stumbling upon your article. His story to you was just as it was to me. Glad to see he’s still doing well. I sure enjoyed his company. In hindsight, he also gave me some really great insights on a situation that didn’t arise in my life until years later. Good guy, in my opinion. I’m sure he’d love to hear from you. PS. And yes….he’s a great guy!